Jan Daciuk, Dawid Weiss: Smaller Representation of Finite State Automata. Theoretical Computer Science, vol. 450, 2012, pp. 10—12. Jan Daciuk, Dawid Weiss: Smaller Representation of Finite State Automata. In: Lecture Notes in Computer Science, Implementation and Application of Automata, Proceedings of the 16th International Conference on Implementation and Application of Automata, CIAA'2011, vol. 6807, 2011, pp. 118—192. Adam Dudczak, Jerzy Stefanowski, et al. : Evaluation of Sentence-Selection Text Summarization Methods on Polish News Articles. Foundations of Computing and Decision Sciences, 1 (vol. 35), 2010, pp. 27—41. Claudio Carpineto, Stanisław Osiński, et al. : A survey of Web clustering engines. ACM Computing Surveys, 3 (vol. 41), 2009, pp. 1—38. Grażyna Chamielec, Dawid Weiss: Modeling the Frequency of Phrasal Verbs with Search Engines. Speech and Language Technology (Technologia mowy i języka), vol. 11, 2009, pp. 255—268. Marcin Sydow, Jakub Piskorski, et al. : Fighting Web Spam. In: NATO Science for Peace and Security Series, Mining Massive Data Sets for Security, vol. 19, 2008, pp. 134—153. Grażyna Chamielec, Dawid Weiss: Modeling the Frequency of Phrasal Verbs with Search Engines. Computational Linguistics — Applications, International Multiconference on Computer Science and Information Technology, Wisła, Poland, 2008. Jakub Piskorski, Marcin Sydow, et al. : Exploring Linguistic Features for Web Spam Detection: A Preliminary Study. 4th Workshop on Adversarial Information Retrieval on the Web, 17th WWW Conference, Beijing, China, 2008. Krzysztof Dembczyński, Wojciech Kotłowski, et al. : Predicting Ads' Click-Through Rate with Decision Rules. Workshop on Targeting and Ranking in Online Advertising, 17th WWW Conference, Beijing, China, 2008. Adam Dudczak, Jerzy Stefanowski, et al. : Comparing Performance of Text Summarization Methods on Polish News Articles. IIPWM'2008 Conference, Zakopane, Poland, 2008. Jerzy Stefanowski, Dawid Weiss: Extending k-Means with the Description Comes First Approach. Control and Cybernetics, 4 (vol. 36), 2007, pp. 1009—1035. Jerzy Stefanowski, Dawid Weiss: Comprehensible and Accurate Cluster Labels in Text Clustering. RIAO'2007 Conference, Pittsburgh, PA, USA, 2007. Stanisław Osiński, Dawid Weiss: A Concept-Driven Algorithm for Clustering Search Results. IEEE Intelligent Systems, May/June, 3 (vol. 20), 2005, pp. 48—54. Dawid Weiss: A Survey of Freely Available Polish Stemmers and Evaluation of Their Applicability in Information Retrieval. 2nd Language and Technology Conference, Poznań, Poland, 2005, pp. 216-221. Stanisław Osiński, Jerzy Stefanowski, et al. : Lingo: Search Results Clustering Algorithm Based on Singular Value Decomposition. In: Advances in Soft Computing, Intelligent Information Processing and Web Mining, Proceedings of the International IIS: IIPWM´04 Conference, Zakopane, Poland, 2004, pp. 359—368. Stanisław Osiński, Dawid Weiss: Conceptual Clustering Using Lingo Algorithm: Evaluation on Open Directory Project Data. In: Advances in Soft Computing, Intelligent Information Processing and Web Mining, Proceedings of the International IIS: IIPWM´04 Conference, Zakopane, Poland, 2004, pp. 369—378. Stanisław Osiński, Dawid Weiss: Carrot2: An Open Source Framework for Search Results Clustering. 26th European Conference on Information Retrieval (Poster session), Sunderland, United Kingdom, 2004. 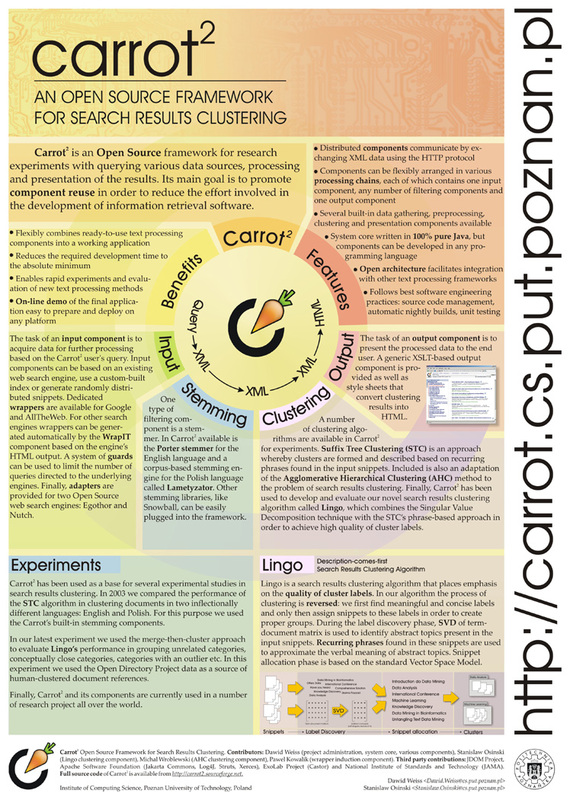 Dawid Weiss, Jerzy Stefanowski: Web search results clustering in Polish: experimental evaluation of Carrot. In: Advances in Soft Computing, Intelligent Information Processing and Web Mining, Proceedings of the International IIS: IIPWM´03 Conference, Zakopane, Poland, 579 (vol. XIV), 2003, pp. 209—220. Jerzy Stefanowski, Dawid Weiss: Carrot2 and Language Properties in Web Search Results Clustering. In: Lecture Notes in Artificial Intelligence: Advances in Web Intelligence, Proceedings of the First International Atlantic Web Intelligence Conference, Madrit, Spain, vol. 2663, 2003, pp. 240—249. Dawid Weiss: Introduction to Search Results Clustering. Proceedings of the 6th International Conference on Soft Computing and Distributed Processing, Rzeszów, Poland, 2002. Irmina Masłowska, Dawid Weiss: Juicer—a data mining approach to information extraction from the WWW. Foundations of Computing and Decision Sciences, 2 (vol. 25), 2000, pp. 67—87. Stanisław Osiński, Dawid Weiss: Introducing Usability Practices to OSS: The Insiders' Experience. The 3rd International Conference on Open Source Systems, OSS2007, Limerick, UK, 2007. Dawid Weiss, Marcin Zduniak: Automated Integration Tests for Mobile Applications in Java 2 Micro Edition. In: Lecture Notes in Computer Science, Business Information Systems, Proceedings of the 10th International Conference on Business Information Systems, Poznan, Poland, vol. 4439, 2007, pp. 478—487. Dawid Weiss: Quantitative Analysis of Open Source Projects on SourceForge. The First International Conference on Open Source Systems (OSS 2005), Genova, Italy, 2005. Dawid Weiss: Measuring Success of Open Source Projects Using Web Search Engines. The First International Conference on Open Source Systems (OSS 2005), Genova, Italy, 2005. Dawid Weiss: Carrot2: Design of a Flexible and Efficient Web Information Retrieval Framework. Third International Atlantic Web Intelligence Conference (AWIC 2005), Łodź, Poland, 2005, pp. 439—444. Maciej Hapke, Andrzej Jaszkiewicz, et al. : OPHELIA—Open Platform for Distributed Software Development. "Open Source for an Information and knowledge society", Proceedings of Open Source International Conference, Malaga, Spain, 2004. Maciej Hapke, Andrzej Jaszkiewicz, et al. : OPHELIA—Software Development Tools Integration Technology. In: Problemy i metody inżynierii oprogramowania, wyd. WNT, Proceedings of the Fifth KKIO Conference (Poster session), Szklarska Poręba, Poland, 2003. Pauline Wilcox, Craig Russell, et al. : A CORBA-Oriented Approach To Heterogeneous Tool Integration; OPHELIA. ESEC/FSE Workshop on Tool-Integration in System Development, Helsinki, Finland, 2003. Rick Dewar, Mike Smith, et al. : The Ophelia Traceability Layer. 2nd Workshop on Cooperative Supports for Distributed Software Engineering Processes, Benevento, Italy, March 25, 2003. Cornelia Boldyreff, Rick Dewar, et al. : Environments to Support Collaborative Software Engineering. 2nd Workshop on Cooperative Supports for Distributed Software Engineering Processes, Benevento, Italy, March 25, 2003. Krzysztof Kowalczykiewicz, Dawid Weiss: Traceability: Taming uncontrolled change in software development. Proceedings of the IV KKIO Conference, Tarnowo Podgórne, Poland, 2002. Ken Farion, Wojtek Michalowski, et al. : Clinical Decision Support System for Point of Care Use: Ontology Driven Design and Software Implementation. Methods of Information in Medicine, 4 (vol. 48), 2009, pp. 381—390. Jerzy Blaszczynski, Ken Farion, et al. : Mining Clinical Data: Selecting Decision Support Algorithm for the MET-AP System. Lecture Notes in Computer Science, vol. 3581, 2005, pp. 429—433. Wojtek Michalowski, Szymon Wilk, et al. : Bayesian Belief Network Model of a Clinical Caremap: Implementation of the Radical Prostatectomy in MET Support Environment. CORS 2005 Annual Conference, invited presentation, Halifax, Canada, May 2005. Szymon Wilk, Jerzy Blaszczynski, et al. : Extending the IT Infrastructure in Healthcare with Mobile Technology. Global Mobile Enterprise 2004, Vertical Market Focus - Healthcare, Ottawa, Canada, September 2004. Grażyna Chamielec, Dawid Weiss: Modeling the frequency of phrasal verbs with search engines. Institute of Computing Science, Poznań University of Technology, Poland, Research Report RA-05/08, 2008. Adam Dudczak, Jerzy Stefanowski, et al. : Automatyczna selekcja zdań dla tekstów prasowych. Institute of Computing Science, Poznań University of Technology, Poland, Research Report RA-03/08, 2008. Dawid Weiss: A Framework for Testing Mobile Applications in Java2 Microedition. Institute of Computing Science, Poznań University of Technology, Poland, Research Report RA-019/06, 2006. Dawid Weiss: Stempelator: A Hybrid Stemmer for the Polish Language. Institute of Computing Science, Poznań University of Technology, Poland, Research Report RA-002/05, 2005. Dawid Weiss: A Large Crawl and Quantitative Analysis of Open Source Projects Hosted on SourceForge. Institute of Computing Science, Poznań University of Technology, Poland, Research Report RA-001/05, 2005. Dawid Weiss: Polish Grammar is Beautiful. 2005. Dawid Weiss: Spam is beautiful. 2004. Dawid Weiss: Choć na chwilę zdjąć gogle (Take off these goggles for awhile...). Magazyn CHIP (Polish edition of CHIP Magazine), 9, 2002. Dawid Weiss: Szukanie igły w Sieci (Looking for a needle in the Net). Magazyn Internet, 5 (vol. 80), 2002. Dawid Weiss: Cena e-Kultury (The price of e-Culture). Magazyn Internet, 6 (vol. 81), 2002. Dawid Weiss: Descriptive Clustering as a Method for Exploring Text Collections. PhD thesis. Poznan University of Technology, Poznań, Poland, 2006. Dawid Weiss: A Clustering Interface for Web Search Results in Polish and English. MSc thesis. Poznan University of Technology, Poznań, Poland, 2001. Filip Pankau, Maciej Szkopek, Dawid Weiss, et al. : Automatyczne tworzenie bazy wiedzy na podstawie informacji z sieci Internet. BSc thesis. Poznan University of Technology, Poznań, Poland, 1999. Dawid Weiss: Capture-Replay Tests in J2ME. October, 2007. Dawid Weiss: Massive Distributed Processing using Map Reduce. January, 2007. Dawid Weiss: Grupowanie wyników zapytań do wyszukiwarek internetowych. January, 2004. Dawid Weiss: O szukaniu sensu w stogu siana — algorytmy grupowania wyników z wyszukiwarek internetowych i propozycje ich ulepszenia przy wykorzystaniu wiedzy lingwistycznej. October, 2003. Paweł Kowalik, Stanisław Osiński, et al. : The Carrot2 Project. Milestone report (release 0.1). June, 2003. Dawid Weiss: Poszukiwacze Zaginionej Informacji. May, 2003. (c) Dawid Weiss. All rights reserved unless stated otherwise.